Syllabus of the Online Course (Subject): Wipro Group. 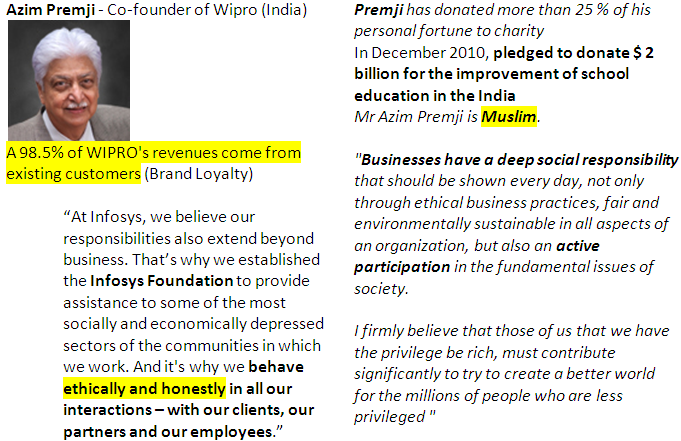 Azim Hashim Premji (Muslim Businessman. India). In 2001, Azim Premji founded the Azim Premji Foundation with his financial resource. The Muslim Businessman Azim Premji was the first Indian to form part of the Giving Pledge (W. Buffett and Bill Gates), to encourage the rich to commit to giving most of their wealth to philanthropic causes. On April 2013, he said that he had donated more than 25 percent of his fortune to charity. Azim Hashim Premji was born in the bosom of a Gujarati family converted to Islam (“Khojas”) of the Shi'ism Ismaili branch.